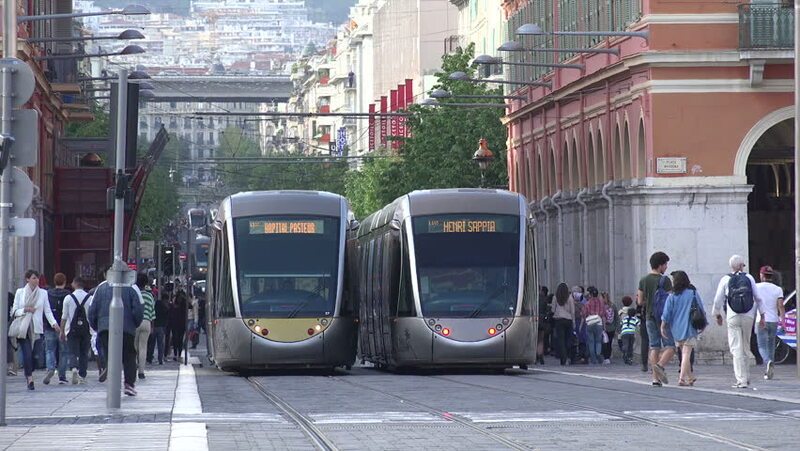 NICE, ALPS MARITIMES/FRANCE - APRIL 29, 2015: Unidentified people cross road as tram passes along avenue jean medecin. The tramway system opened in 2007.
hd00:48NANTES FRANCE - MAY 2009: One of the light rail trams passes by camera. 4k00:12Montpellier, France - April, 2017: Two trams on a street. hd00:12HONG KONG - CIRCA JUNE 2011: Chinese pedestrians walking down busy shenzhen sidewalk. 4k00:13LONDON - FEBRUARY 3, 2017: A Police car attempts to respond rapidly to an emergency call with blue flashing lights but is delayed by traffic congestion at a busy intersection in Mayfair, London, UK.